How walkable is your neighborhood? Walkscore, one of my favorite mashups. 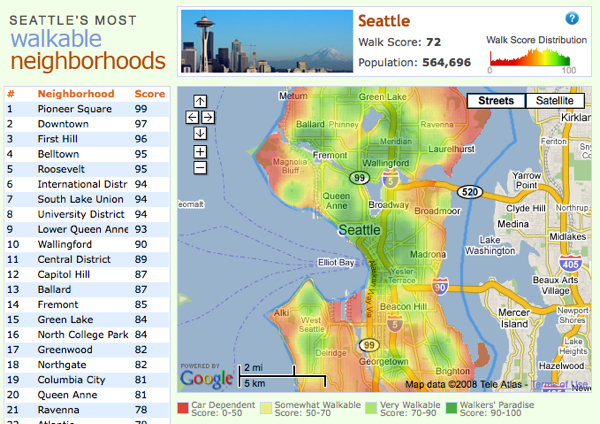 does a good job of rating the walkability of areas in cities. Give it an address and it will use the Google Local Search API to check for parks, stores, and restaurants within walking distance. Walkscore weights their distance and then assigns that location a score between 0-100 (if you want to be a walker, 100 is best). Last week Walkscore rolled out ratings for all the neighborhoods in Seattle. Using Zillow’s API, they’ve created a great interactive map that lets you see the neighborhood boundaries as you mouse over the map or the list. My home address (and coincidentally the address of O’Reilly’s Northwest Office) scores an 86.My neighborhood, the Central District, gets overall score of 89 and a rank of #11. This seems very accurate to me. I do have to walk a bit to get to most services. They aren’t on my block yet. Walkscore is one of my absolute favorite mashups. It’s a great example of how you can extract hidden meaning from a common data source (business listings). However it isn’t able to take all of the relevant data sets into account (as the creators readily admit and explain. I have to walk up a hill to get to most services (-1 point). How safe is my neighborhood? I’ll have more knowledge once a service like Everyblock scrapes liberates Seattle’s police data. What it doesn’t take into account makes it really obvious how much potential data there is for any location and how little of that data is readily available. To keep Walkscore and other mashups moving forward its creators will need more open data sources. This is one of the reasons that data repository sites like Placebase, GeoCommons and Swivel have sprung up. There will always be someone who can find value in a data set. flexibility in the way they can utilize the boundaries.